As I’m closing in on my MSIS program at the UT School of Information (holy wow, has it really been two years already?? ), I’ve started working on the “capstone” professional experience project that is meant to bind up all the skills I’ve acquired over the past four semesters and bring them all together into one demonstrable project that I will complete over the course of this semester. My project is to work with an archivist and medievalist in the Harry Ransom Center to catalogue and digitize part of the HRC’s Pforzheimer Manuscript Collection. The subset of the larger Pforzheimer collection that I’m working with is called the Bulstrode Newsletters. It is made up of a series of manuscript newsletters written between 1667 and 1688 from journalists in the London metropolitan area to several recipients. The newsletters represent the “correspondence journalism” of the time period: gentlemen living in the countryside or abroad could subscribe to a newsletter office for an annual fee and receive updates by letter from a journalist reporting current events in London as well as transcripts of speeches and presentations in Parliament. 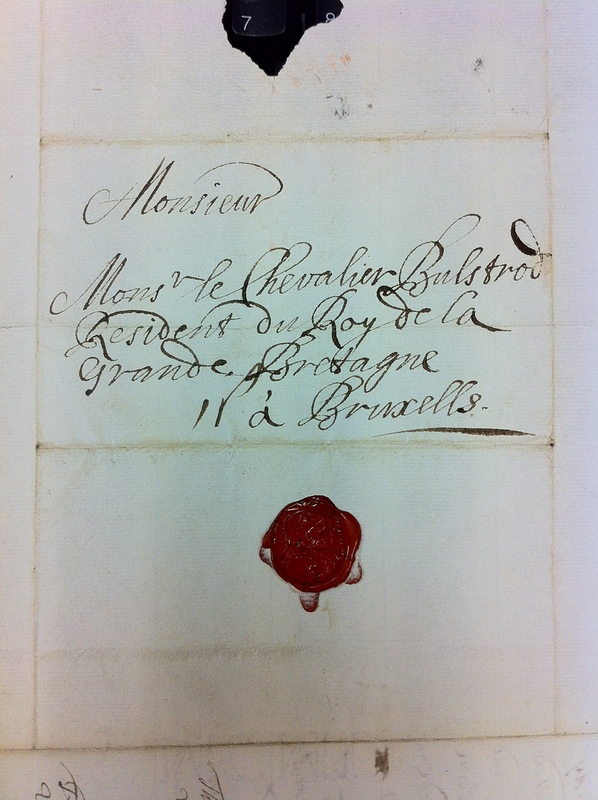 The address of Sir Richard Bulstrode in Brussels and the wax seal from Edward Coleman’s office. The collection that I’m working with is comprised of letters that were mostly sent to Sir Richard Bulstrode, an English diplomat and writer who fought in the English Civil War for the king and as part of the Prince of Wales’ horse. Bulstrode was implicated in two thefts in 1665 and fled to Bruges, where he was captured and imprisoned for two years. While in prison, Bulstrode converted to Roman Catholicism. 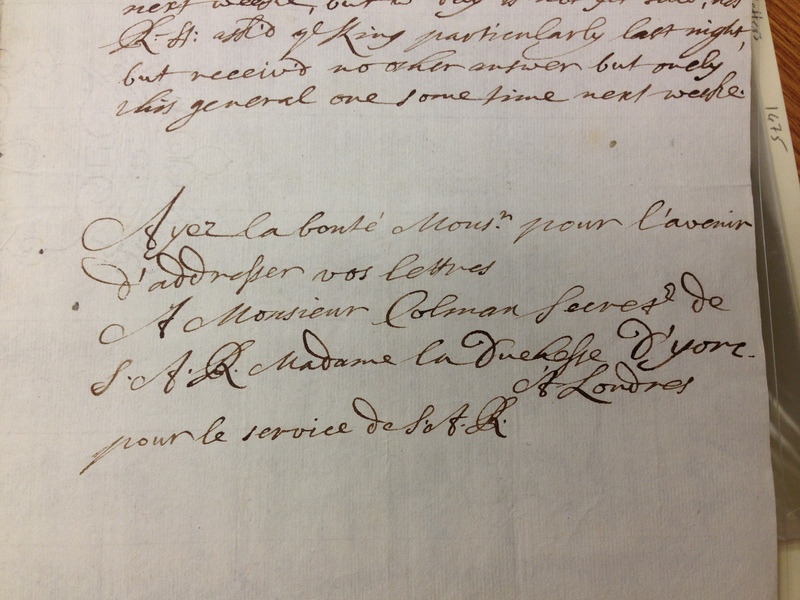 In July 1674 he was appointed an agent for the English crown in Brussels and was knighted. Eventually he became James II’s ambassador to Brussels. After the Glorious Revolution in 1688 which resulted in the deposition of James II and the accession of William and Mary, Bulstrode remained in Brussels and continued to work as a loyal agent of James II. Most of the letters in the collection were sent by a newsletter office run by Sir Joseph Williamson, the Secretary of State. Williamson’s newsletter office was highly regulated and almost acted as a propaganda outlet for the state, with a moderated system meant to keep certain aspects of government out of the eyes of the citizenry. However, part of the Bulstrode collection includes letter that were sent by Edward Coleman, the secretary of the Duchess of York. Coleman was convicted of being part of a Catholic plot to kill the king and the only evidence that exists that Coleman the traitor and Coleman the newsletter-writer were one and the same person is in our collection in the form of a note asking Bulstrode to send return letters via the Duchess of York’s house in London. The letters as a whole deal with day-to-day events at the British court and in Parliament, but there are some other rich tidbits related to the activities of other countries (particularly France) and sensational or unusual trials. One of my favourite letters talks about how “disappointed” the French were after one of their warehouses of supplies for their war in Sicily was burned down. My capstone project is going to involve a lot of the things I’ve learned at the UT iSchool: cataloguing, digitization, metadata standards, digital collection management, and good old research and reference work. I’ll produce a finding aid for the Bulstrode Newsletters, oversee the digitization of the letters by HRC digitization technicians, create rich descriptive metadata for the digital assets and encode transcriptions for the first 300 letters. It’s an exciting project and I’m really happy to have the opportunity to work with such a rich source of historic information. I’ve already finished the first two steps of the project, which were to survey every letter and make sure that we had everything that we thought we had. The list of letters was based on a microfilm version that was produced about ten years ago, but it turned out we had almost 50 letters that weren’t part of the microfilm collection. A “before” look at the way the letters were stored, leaving them to bend inside their boxes. The collection was also horribly out of order—the letters are often dated in English Old Style dating, where new years start on March 26th instead of January 1st. Because of that, many of the letters were out of order and I had to sort through them all and make sure that they were presented chronologically. 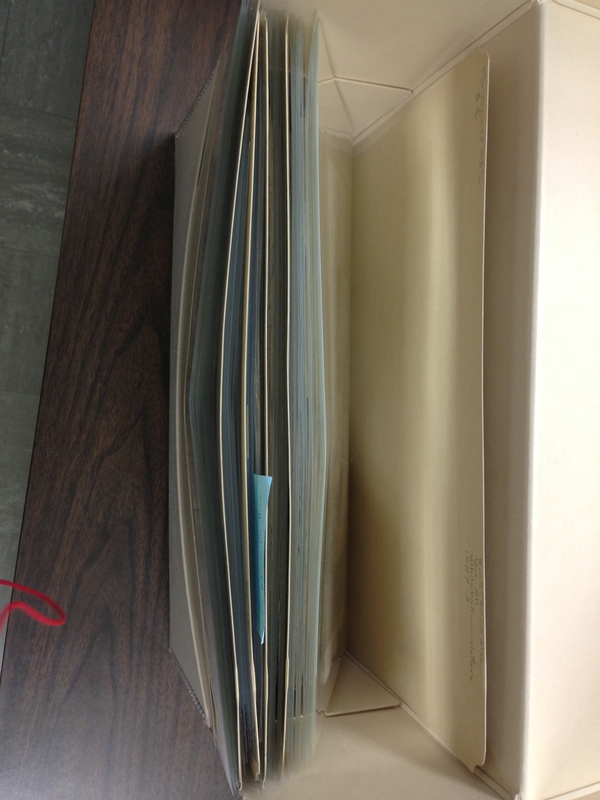 I also rehoused all of the letters into new archival folders and document boxes with stiff supports to try and reduce the amount of bending and curving stressors put on the manuscripts. 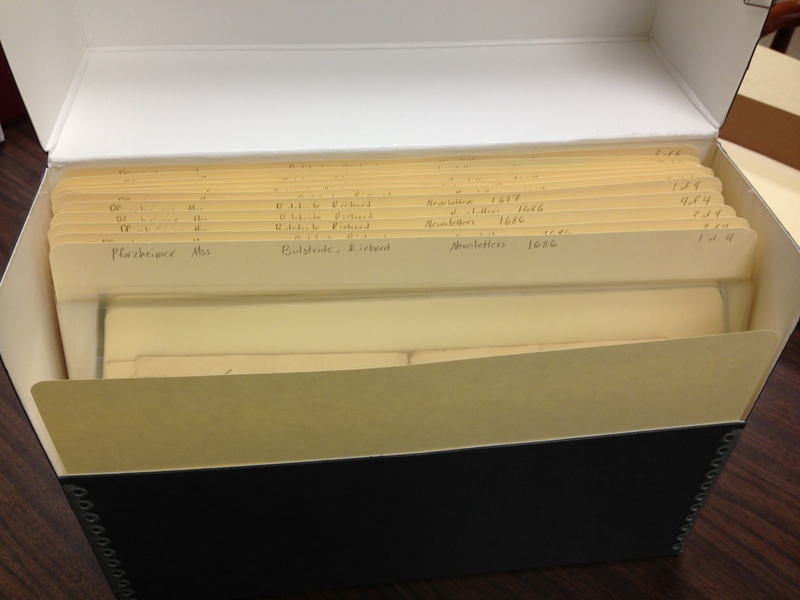 Previously the letters were stored in 3-4 folders per document box—now there are 12-13 folders per box with 20-25 letters per folder. This is great from a conservation standpoint because it reduces the risk of tearing or other physical damages to the delicate paper pages. It was remarkably zen work. Phase three of my project is to create the rich metadata for each letter before the records are imported from the current SQL database into ContentDM. Each letter needs a title, description, date, place, and other important descriptive information attached to its record before the digitization can commence. I’ve finished one box and most of a second, which puts me about one third of the way through the entire collection. It’s slow going and after about four hours of working on it I start to go a bit loopy, but it’s important work and I’ll feel satisfied to know that when everything goes into ContentDM later it will greatly improve the search-ability and discover-ability of the collection. And after! All nice and tidy and securely supported. The Folger Shakespeare Library also has a collection of newsletters written by Sir Joseph Williamson’s office called the Newdigate Letters. My supervisor at the Ransom Center and I are both hoping that I can find a grant and some time to make it to the Folger this summer and do a little extra work to compare their letters to ours. 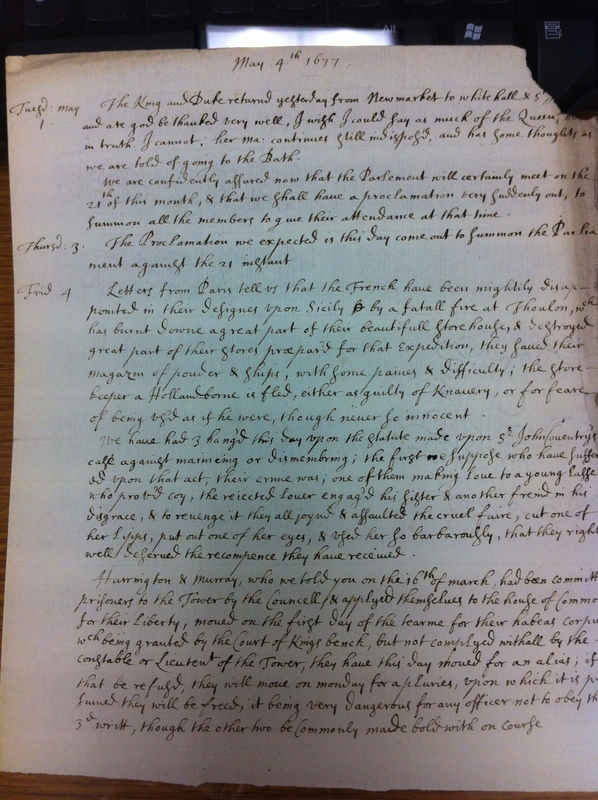 There’s many great opportunities for mining these letters for new insights for historians of the seventeenth century, and I hope to find a way to raise awareness of the collection and help researches navigate it. This entry was posted in iSchool Coursework, Pictures by Lydia Fletcher. Bookmark the permalink.